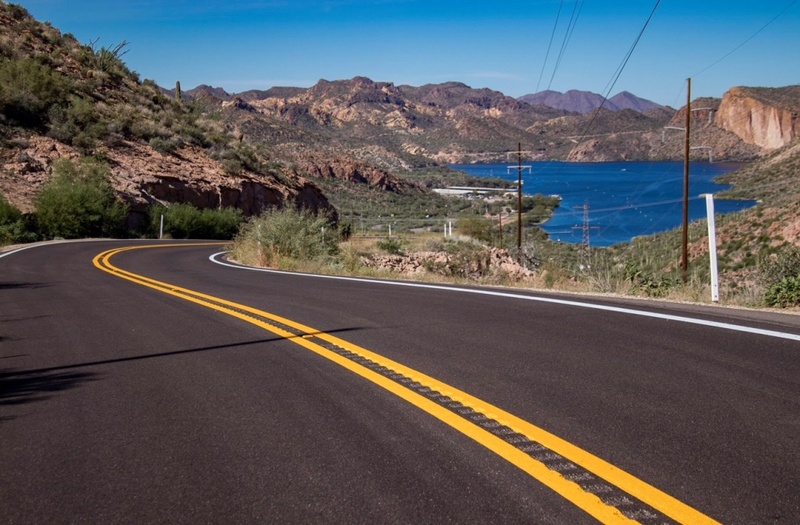 With a project to resurface the roadway and construct improvements along a 17-mile stretch of State Route 88 (Apache Trail) complete east of the Valley, the keys to safety on this historic, winding roadway remain obeying the speed limit, staying alert and not driving impaired. The Arizona Department of Transportation has finished $6.5 million worth of improvements that include paved vehicle pullouts, adjustments to several curves and replacement of some existing sections of old guardrail. But these important safety improvements are no substitute for safe driving along a roadway that, due to the area’s topography, has always been designed for lower speeds. In addition to primary posted speed limits ranging between 25 and 40 mph, drivers should heed slower advisory speed limits on signs and, now, painted on the roadway at points such as curves. Slower advisory speed limits range between 10 and 20 mph. According to data provided to ADOT by law enforcement agencies, speed too fast for conditions was the most common driver violation in crashes along this stretch of SR 88 in 2017 and the first half of this year. Officers cited speed too fast in 40 percent of crashes. Violations cited in another 20 percent of crashes included failing to keep in the proper lane and driving in the opposing lane, passing in no-passing zones and following too closely. About one of five crashes involved alcohol or drugs. SR 88 is a historic roadway that travels in part within the Tonto National Forest. The Apache Trail’s origin dates back more than 100 years as a route to transport materials, equipment and workers for construction of Roosevelt Dam. The completed project also installed new raised pavement markers, centerline rumble strips to warn drivers if their vehicle is drifting into an opposing lane, and new signs. Crews also improved the ride along SR 88 by resurfacing the highway starting 3 miles northeast of Apache Junction and extending to 7 miles beyond Tortilla Flat. Improvements started in fall 2017 and included the removal of several large and potentially unstable boulders above the highway. For more information about ADOT’s state highway improvement projects visit azdot.gov/projects. Too bad a bike path wasn't added. Sure is treacherous for all.